The goal of antibody engineering is to combine various antibody domains to generate customized antibodies that show specialized binding properties, optimal half-lives and desirable effector functions. Antibodies can be engineered to make mutant proteins of higher affinity or smaller molecular variants that retain or change the functional properties of the original antibody. 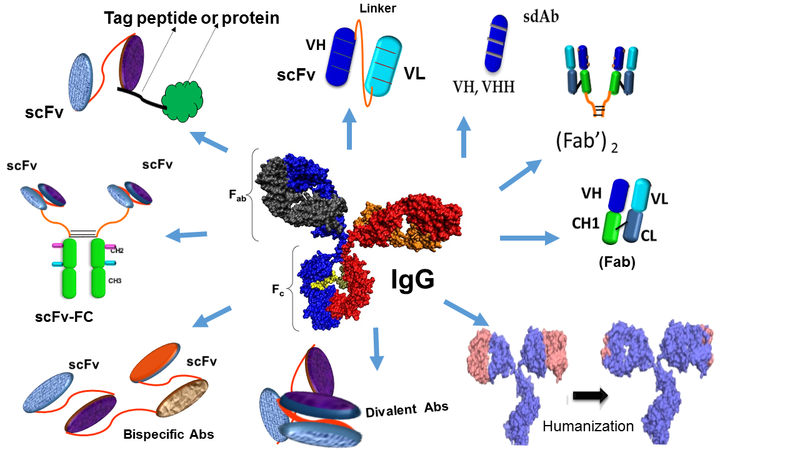 Schematic representation of different antibody formats, showing intact ‘classic’ IgG molecules alongside humanized IgG, single chain fragment variable (scFv–Fc) immunoglobulins. A variety of antibody fragments are depicted, including Fab, scFv, single-domain antibody(sdAb) VH, VHH and multimeric formats, such as bispecific-scFv, diabodies, enzymatic conjugated Tag- scFv. AbET core provides a service for affinity maturation of antibodies by creating target specific mutations in a sub-library of an antibody gene to cover most possible amino acid exchanges. For lead optimization, the sub-library antibody clones are screened using phage or yeast display technology. AbET core provides a service to construct a numerous recombinant antibody formats using either the entire antigen-binding fragment (Fab), or the single chain variable fragment (scFv), or single domain antibody libraries (sdAbs), which include the VHH from camelid and shark, and scFv-Fc. See on the alternative antibody formats page. Therapeutics modalities have been developed using bispecific antibodies which have different specificities on each antigen binding arm to target different sites within the cell. By targeting two different receptors in combination on the same cell, these antibodies can induce modifications of cell signaling, including the inactivation of proliferation or inflammatory pathways. Bispecific antibody drugs are designed to target T cells to kill tumor cells by binding to both a T cell and a tumor cell, whereas most other bispecific antibodies are intended to interact with two different disease mediators such as cell surface receptors, soluble ligands and other proteins. AbET core provides service for design, construction, and expression of different format bi-specific antibodies with broad applicability for clinical applications.